A few days ago I launched this poll: http://www.surveymonkey.com/s/W82N6TY covering authors affected by Kobo’s actions. It’s been live for three days, with answers from many authors covering over 1000 books: an interesting poll with some interesting results. People believing their books were live when they were not. Many overseas authors did not realise that their books can be live on their author accounts and the US site, but had been removed from the UK site. I received a number of corrective emails when they realised. Likewise authors in other genres assumed because the books were not adult they had not been removed and did not check. Some questions were poorly worded – the details that came out in the comments revealed a lot of extra data. Although I made submitting names optional, it did become obvious where people had tried to skew results. From the pattern of unnamed entries, this is particularly obvious. I don’t have space to graph everything, so I’ll stick with a few and mention a few other interesting trends from comments. *10% of the respondants identified as purely publishers. *20% of the respondants identified as author/publishers (publishing themselves and others). 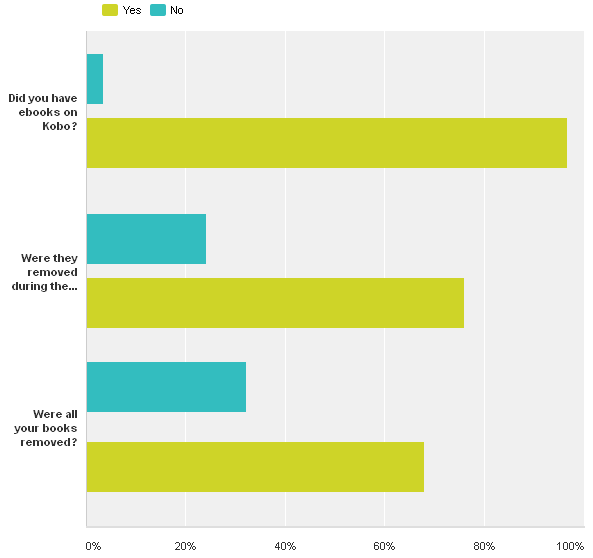 *Of the authors who responded, about 20% of the books removed were small press (Publishers skipped this question). These figures would indicate a significant proportion of the books removed were not self-published. Was it only adult content being removed? The answer is a definitive ‘no’. The genre chart is too large to add, but Erotica was not in the majority of removed books, or even the largest category. Science Fiction, Fantasy and Romance were all level or above it. History and Thrillers trailed it slightly. 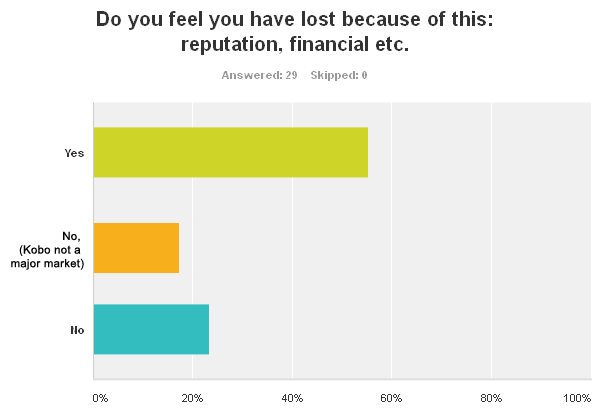 Otherwise losses were spread evenly across genre – including children’s. Many authors across all genres felt they had been harmed by the actions taken. Several of those who did not lose all (or even any of) their books were concerned about reputation, and there were several commenting that they would not return to Kobo, or use it in the future. The most negative opinions were held by authors who were not writing adult material and lost books anyway. Smiths are definitely taking the majority of the blame in the comments, largely due to the wording of their statement. It was perceived by many as labelling all self-publishers and small presses (in fact anything outside a major publisher) as pornographers. From a retailer who apparently sells adult print books (e.g. Black Lace and Mills & Boon which is currently available from their website – see screenshot) this has been taken badly, and the comments are heated. There is a perception that WH Smiths forced Kobo to act, and Kobo has left self-published titles available outside the UK, which may account for its less negative view. Two major themes in comments were the hypocrisy of promoting Fifty Shades of Grey (initially self-published) while banning children’s books, and the fact that WH Smiths appeared to not be filtering content already marked as adult. 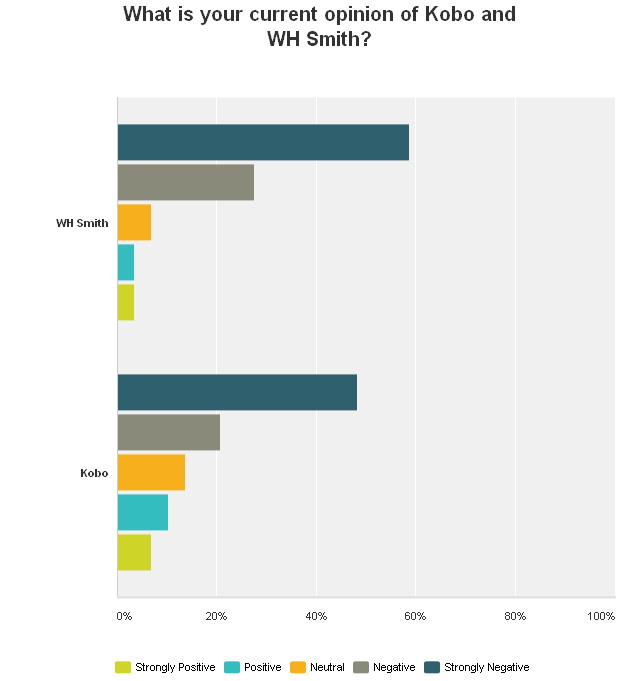 The people who held “strongly positive” opinions of Smiths did not leave their names or comments (or fill in several other questions…), so it is impossible to follow up. The one named positive opinion was held by an author who blamed Kobo for not filtering. The over-all opinion however is unanimous that filtering should have been in place (in the same way no one would put a messageboard up without a moderator), and that since these books were labelled and reviewed on Kobo before they went live, WH Smith’s filter should have caught them. After the PLR debacle on Amazon a few years back, it is well known that marketers will put these books, often cribed from fan sites or freeware, anywhere they think they will be bought and bookstores need to be aware and stop this. Somewhere either Kobo or WH Smith dropped the ball on a very well-known issue. Attempting to put the blame on self-published authors? That’s going down like a lead balloon. If you want to use the graphs in a blog post, feel free, but please link to the survey to continue gathering results.